AmericanMuscle’s video host, Justin Dugan, has completed Stage 3 of his 2014 Mustang GT project car! We have been following Justin’s build closely as he personalized his 2014 Mustang GT and gave it a touch of GT500 inspiration. Over the course of a few months Justin has performed a range of mods to increase not only the power and handling of his Mustang, but also the styling. Justin created one well-rounded Mustang that isn’t a stock slouch or a copy cat of another ride, giving him a truly personalized and polished Mustang! In Stage 1 of his build, Justin added some nice starting modifications to get the ball rolling on his project; nice, but tame, power adders and exhaust changed the sound and function of his Mustang, while some suspension pieces gave him a Mustang that can handle. In Stage 2, Justin expanded upon the modifications he performed in Stage 1, beefing up his power output, while also giving his Mustang some nice styling cues. Stage 3 ties together the whole project by solidifying the GT500 inspiration and adding some nice styling touches to make his Mustang a real head turner. Going into Stage 3, Justin had already done a variety of modifications to the exterior of his Mustang. To make his Mustang a little more well-defined and aggressive, Justin added the Roush Front Chin Splitter, Roush Side Rocker Panel Splitters, and Roush Rear Side Splitters. These Roush parts accentuated the body lines of Justin’s 2014 Mustang and helped to give his pony a more dominant presence on the street. Backing up his styling modifications were some performance mods, the most noticeable being a set of Staggered 2013 GT500 Charcoal Wheels wrapped in Mickey Thompson rubber. Justin also added SR Performance Rear Lower Control Arms to round out and complete the suspension work on his Mustang. By adding these improved wheels and tires with rear lower control arms to eliminate wheel hop, Justin’s Mustang is able to properly put down all of the power he added in the first two stages of his build. Up until Stage 3, all of Justin’s modifications have been centered around the exterior of his car, while leaving the interior untouched. In Stage 3, Justin shifted his focus to the interior of the Mustang an addressed the interior with some styling and performance goodies. Justin started off with a Carbon Fiber Dash Overlay to make the dash of his Mustang sleek and clean, giving it the feel of the California Special dash. To clean up the entertainment center of his Mustang, Justin added the Raxiom Navigation system. The Raxiom kit is an amazing system with OEM fitment, that when paired with the dash overlay kit, changes the whole appearance of the interior while providing a high-level of functionality. To top it all off, Justin also threw in a PLX Touch Multigauge that allows a high level of monitoring and functionality in Mustangs. The multigauge is a great substitute for folks who do not have the track apps built into their 2011 – 2014 Mustangs. 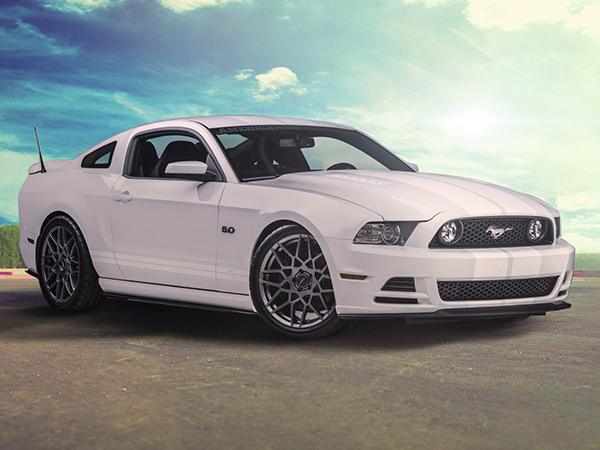 Justin took his stock Oxford White 2014 Mustang GT and transformed it into a one-off GT500 inspired modded-menace. Justin made sure to make his Mustang a well-rounded machine by focusing on each area of the car and neglecting none. From the interior to the exterior, power to handling, and style to functionality, Justin covered all of his bases making one sick Mustang in the process! What are the power numbers before and after the CJ intake and TB? Awesome build btw.